2018 began with no small amount of heartbreak for the McKay family. In December Luke’s dad, Bob, was diagnosed with cancer and one short month later he was gone. Losing a man who loved his family well and never missed one thing his grand kids did no matter what state they were currently living in deserves its own reflection. For now, let it be enough that his absence was deeply felt as Sawyer graduated college in May with Sam and our nephew, Matthew, graduating high school soon afterwards. To give us all something to look forward to during this season of mourning and to celebrate the boys’ accomplishments we planned an epic vacation to Arizona via California I like to describe as “Innocents Out West” subtitled “If Home Alone and the Griswolds had a Baby”. The trip also deserves its own chronicle however during a Hummer tour of the Sedona red rocks our guide, Phil, pointed out an interesting cactus he called a Century plant. 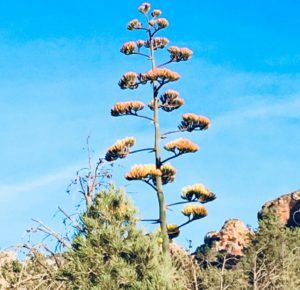 The base looked like a gigantic aloe with a brightly-colored flower towering 20+ feet into the air. Phil explained we were seeing a rare occurrence since it only bloomed once in a lifetime – generally when 25-30 years old. After blooming, it would die and go to seed. I was mesmerized by this plant, took its picture, looked it up on the internet. It felt significant to be witnessing this singular event, this explosion of color knowing it would also bring about the dying process. The imagery of a once-in-a-lifetime bloom spoke to me and if only applying it to desert vegetation one could almost consider it romantic. When images capture my imagination I often work them around in my mind to see how they may translate to spiritual metaphor. The longer I contemplated this one all thoughts of romance died. Why? There are far too many believers with a once-in-a-lifetime sense of purpose perfectly content to have experienced a singular period of obedience and go to seed knowing the brightest days are those lived sometime prior to now. Who among us has ever experienced a season of absolute certainty we were operating within God’s call on our lives, of serving others before ourselves, of incredible wonder when God was moving in our midst only to have it wither and die? How many believe we were only allowed one “bloom” but we blew it so there’s nothing left to do now but go through the motions until we are called home? There’s a NeedtoBreathe song called “Wasteland” with the lyric, “There was a greatness I felt for a while and somehow it changed.” Perhaps this resonates as it did with me. What brings about this sudden shift or sometimes slow departure from assurance and harmony with God’s intent for our existence? Find a few clues by thinking through scripture of those we know were dwelling in obedience and then suddenly… weren’t. Adam and Eve’s fall. Noah’s drunkenness. Abraham’s lapse of faith. Elijah’s exhaustion. David’s adultery. Peter’s denial. Mark’s desertion. One thing we know from these examples – when things change it’s because we change. God didn’t nor will He. Ever. (James 1:17) He will not reinterpret his commands to fit a new situation or generation. He will not invoke goodness over our badness. He will not stomach our pride. He will not let a soul be at peace when it’s not seeking Him fully. He will not give rest from Him, only in Him. These men and women are all known for their failures however I would rather focus on their restorations. The mistakes were not once in a lifetime but neither were their successes. The fall was not the end of the story for any one of them and believer – it’s not ours either. Your heart may be dry as a bone and flowers long faded but as long as we draw breath there is always opportunity to bloom again and time for a comeback. First, I am sorry for your family’s loss. I will be praying for you all as you continue to adjust and grieve. Second, Sawyer finished college?! Where does time go? Congratulations to him. And, lastly, thank you for this. It makes me think on how we must be on our guard, especially following a time of seeing God work in amazing ways. Looking forward to what follows. Spot on, as always my friend. We have a bunch of those Century plants around here. People like to use them on each side of the driveway. Because 25 or 30 years with that shrub is a long time to most people. And now that this year is our 30th anniversary, we’ve been seeing a bunch of them shoot up to the sky to bloom and then die. So bizarre. Yet another one of God’s amazing creations. I love the spiritual analogy you pointed out.